When does something move from being just the current fad into an icon or a classic? The best sign of a brand’s staying power is how it remains relevant through the passing of time. When the first TechnoMarine collection was launched at the Basel Watch Fair in 1997, one of the anchor models showcased was the Cruise. Inspired by the elegant, yet relaxed, seaside city of St. Tropez , the original Cruise was a symbol of pleasure combined with luxury, marrying a colorful gel strap and a bezel studded with diamonds. 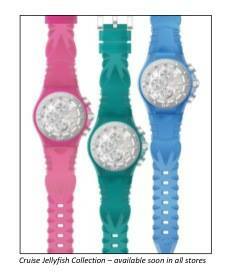 It was the first of its kind to feature interchangeable straps and face covers, another nod to both fun and functionality in a timepiece that could be taken from the boardroom to the beach with ease. The brand has grown and the collections increased as the years have passed, while this bestselling Cruise model has undergone a few changes to keep it both timeless and current. 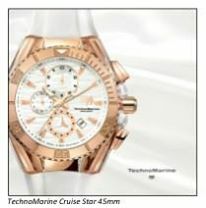 Sporting a bezel in stainless steel or PVDcoated pink gold, sapphire crystal and a Swiss quartz movement, each Cruise chronograph is water resistant up to a depth of 200m, and while not recommended for scuba diving makes the perfect accessory for swimming and other surface based-water sports. 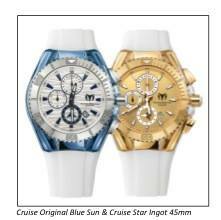 The latest Cruise collections feature two lines in sizes of 40 and 45mm. 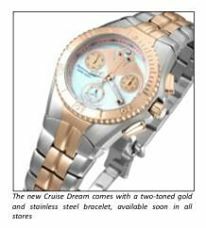 The Cruise One has a classic black or white base, while the Cruise Star sports a blazing pink hue for a more eye-catching, stylish look reminiscent of those sunsets on the French Riviera. Special edition timepieces are the Blue Sun, with a dynamic wave pattern on its dial to recall those moments spent on the water, and the Star Ingot, which showcases a face and bezel in bright and sunny yellow gold. 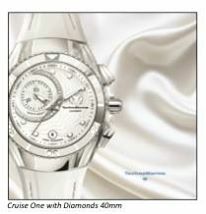 Each Cruise model comes with the signature interchangeable straps, thereby ensuring versatility suited to any occasion. In a time where changes can happen all too quickly, the modern classics will always stand out. This is evident in the consistent popularity of the Cruise Collections, and these newest timepieces seem just as destined to make their mark. 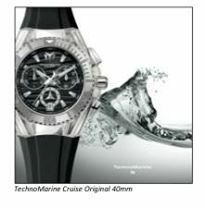 TechnoMarine is available at Edsa ShangriLa Plaza Mall, Greenbelt 3, TriNoma, SM Megamall, SM City North Edsa, Robinsons Magnolia, Robinsons Galleria, SM City Cebu, SM Lanang Premier, also at My Tempo and select My Diamond stores.